This year I am experimenting for the holiday cookie exchange. 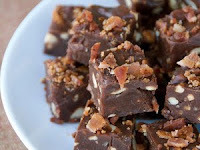 For your consideration, Bacon cookies and Bacon Fudge! 1. make the candied bacon: preheat the oven to 350 F. lay bacon on a parchment covered baking sheet so they are not overlapping. sprinkle about 2 tsp brown sugar evenly on each strip of bacon. bake for 12 minutes, remove from oven, flip bacon and drag it through the syrupy liquid that’s collected on the baking sheet. put the bacon back in the oven for another 12-15 minutes, until it is fully cooked and very dark (mahogany). remove the strips from the sheet and cool on a wire rack. after they have cooked, chop them or quickly food process into tiny pieces. 2. make the cookies: combine flour, baking soda and salt in a small bowl. beat butter, both sugars and vanilla in a large bowl. add eggs, one at a time, beating well. gradually beat in flour mixture. stir in morsels and bacon pieces. 3. spoon dough (about a Tbsp per cookie) onto an ungreased baking sheet and bake at 375 F for 9-11 minutes. i tend to go a little under 9 minutes so they come out just underdone. remove to cooling racks or eat immediately with a tall glass of cold milk.